After interviewing just about every LOLCAT I could find about the recent trend of Picross/nonagram games, there seemed to be three prevailing themes: “COLOR CROSS IZ GUD” “I CAN HAZ IPHONE?” and “NEEDS MOAR KITTIES”. Admittedly, these may not have been the most eloquent interviews of my career, but the message is clear: paint-by-number games are here to stay. But you say you want something new? Well, how about trying the brilliant Color Cross again, but this time with MOAR ANIMALS! Animal Color Cross doesn’t exactly fall far from the tree, but it’s an improvement over the original in a few meaningful ways. I know it sounds like an animal theme is a lame “innovation”, but unlike the first Color Cross, the pictures themselves are much more engaging and distinctive, providing a much more satisfying experience. 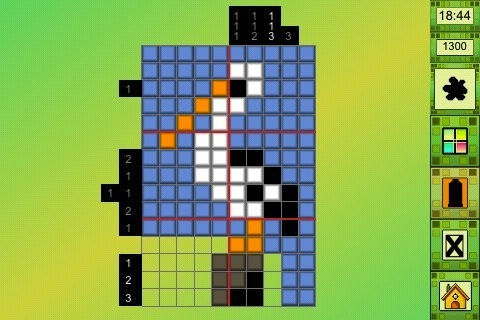 If you’ve never played a Picross/nonagram game before, this would be the one to start with. You start off with an empty grid and with a set of numbers around the outside. The numbers indicate how many squares of the grid must be filled in with a particular color. Successfully completing the puzzle requires a logical approach not entirely unlike that needed for sudoku. By switching back and forth between different colors and carefully studying the numbers, you can gradually fill in the grid to create a picture. Like an Impressionist painting, one blob of color by itself may not seem like much, but put it together with everything else and the image emerges. In the game, you can choose between Classic and Arcade mode. Classic has you traveling across 5 continents, uncovering animals as you go along, while Arcade simply throws various quick fire levels at you. All levels are timed, so you can’t dilly dally too much, and there’s a fair amount of trial and error that enters into it initially, but once you finally start to get it, it really starts to become a fun and even mildly relaxing experience. Bottom line: the game looks great, responds beautifully, and is easy to learn and just pick up and play. There’s a reason it was such a big hit on the Nintendo DS, and it’s no surprise that it’s every bit as fun on the iPhone. 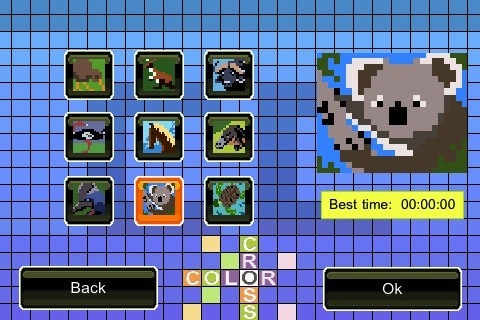 AppSafari review of Animal Color Cross was written by Tracy Yonemoto on August 17th, 2010 and categorized under App Store, Art, Board, Fun, Games, Puzzler. Page viewed 4739 times, 1 so far today. Need help on using these apps? Please read the Help Page.